It is known, that with the appearance and the development of language the man is becoming a unique symbolic animal, passing a way from a biological being to a thinking one. But the reason is that the language, as an informatics object is a developing, open, huge library of interactive symbols, elements. Each of the elements is modeling, projecting and means one appearance of the world, out of the edges of the human race particularly and entirely. Taking in set that symbols and elements are summarized in one image of the space, environment, where live and create the users of that language. As the natural conditions, in which our forefathers lived, and the situation, which is expressed by the representatives of that culture, in many cases are changed from one ethnos to another, in the result we observe differences in the languages of various ethnic groups, and, in some cases, the differences are not essential in one ethnic group. As the authors think, these differences obviously appeared in the stages of the development of rock art, rock images and pictures. Sometimes the graphical languages (executive manners, typical forms, etc.) of various ethnic groups are non-similar. It is supposed, that the complexes of the rock images, which were discovered on the historical territory of Armenia, are differed from each other in a measure of mental characteristics and dialect differences of the representatives of Armenian people from various parts and regions of Armenia. The graphical language, symbols and signs are available. They are invariant and never depend on time, geographical and natural coordinates. Many nations had successfully learned and developed this language. Language symbols are general and understandable basically in the limits of one ethnic group, in determined geographical space and time. The language symbols in the speech process are combined with each other, forming infinite number of combinations, which allow to represent simple and complicated, single- and multi-dimensional, white-and-black or colored description of the world, persons place and role, the structure of human relationship. These descriptions without any significant defacements and deformations had being passed from one to the other generation, from one to the other member of the ethnic group. The investigation of letters approximately in IV century B.C. made possible collecting and keeping of similar descriptions (as texts). While, long before it, people already knew how to collect and keep the descriptions as petrography, rock pictures and with the help of graphical language. The authors think that just the moment of the investigation of the graphical archetypes is supposed to be the start of the civilization. The graphical image, picture, symbol or sign, which is fixed on the stone, exists singly, never depends on its creator - «is alienated from him». All this systems possess by the feature of autonomy and independence. Linguist V.V. Martinov call the language  Actuality  2'', in diversity of Actuality  1, which is the world environment. The authors suppose that between these two ''Actualities'' another ''Actuality'' exists. The last one is characterized with a unique ability of the man to create invariant graphical images and symbols, to operate with them in the frames of experience. It allows our forefathers to think and talk about absent events and objects at this moment. Thanks to this feature of the graphical language, which is called shifting ability, the man learned to plan his activity, using his own experience and experience of others and his forefathers, based on imagination processes, which haven't been taken place, and to evaluate his abilities and reserves, to imitate relations, to forecast the events, and in this way to be oriented in space and time (self-training, modeling). The graphical language, the language of petrography and rock pictures allowed a floating, harmonic and efficient (less actions) passing from ''Actuality  1'' to ''Actuality  2''. The construction of ''Actuality  2'' relative to the objective, real or imaginable process, weighing of negative and positive features, hesitation in sincerity of thoughts, projection and development of the structure of logical constructions, choice of more acceptable decisions and their spreading  for all mentioned the man and the human language are obliged to the features of graphical language, as well as to simultaneity, invariance, reflectiveness, regularity, totality, etc. The hieroglyphs or the symbols (the word ideogram comes from the Greek words idea and Im writing) have a significant place in the history of letter writing. Hieroglyphs usually considered to be the first step in the development of letter writing and were on the lowest development degree, as if they do not express sounds or syllables. They express whole words or parts of them and, naturally, do not submit any grammatical rule and cause serious difficulties in reading. Egyptians, Shummers and Chinese implemented this kind of letter writing. The ancient nations, such as Armenian, also had hieroglyphs in their letter writing. The Armenian manuscripts on natural sciences consist of great amount of hieroglyphs. The number of Armenian manuscripts, which reach our days, is 25 000. The greatest collection of manuscripts is kept in the Scientific Research Institute of Ancient Manuscripts (Matenadaran). Here are kept about 10 500 manuscripts. This amount does not contain fragments and documents in foreign languages. A collection of old Armenian manuscripts is kept in the library of Armenian Abbey in Jerusalem, in the libraries of Mchitarian Abbey in Venice and Vienna, in Armenian church of Amenaprkich in N. Djulfa, in British museum, in the library of Vatican, in National Library of Paris, in the depositories of St. Petersburg (State Public Library after M. Saltikov-Schedrin, Orient Institute, etc. ), in the Institute of Manuscripts after K.S.Kekelidze (Academy of Sciences of Georgia), etc. The manuscripts weve got are a part of formerly existed huge libraries. The Armenian manuscripts shared the Armenian nations fare. The foreign invaders were capturing the manuscripts as a prey, often abolish them. Stepanos Orbelyan, Armenian writer of XIII century described how the Seljuks conquered Syunik in 1170, destroyed the library of Tatev cloister, where there were kept about 10 000 manuscripts. The oldest Armenian manuscript which reached our days and contains symbols is dated 1564. These symbols have rather developed forms and the specialists date these symbols 14th century. The Armenians began to be interested in hieroglyphs in the middle of the 18th century. Mchitar Sebastiatsi published 46 hieroglyphs in his work The Grammar of Grabar of the Haykazian Family (Venice, 1730). Almost all the conceptions, connected with the universe  sky, earth, sun, moon, constellation, planets  are mentioned in the Armenian manuscripts by hieroglyphs. The subjects connected to handicraft are mentioned by hieroglyphs as well (gold, silver, lead, iron, etc.). In XIII century the specialists of grammar composed mixed lists of abbreviations and hieroglyphs. A number of scientists were busy with the study of the hieroglyphs. Many of them supposed that these hieroglyphs were the part of the ancient Armenian letter writing, which mechanically passed into Armenian letter writing, which was created in 406. This point of view was rejected by famous linguist Hrachyah Acharyan, who considered, that the Armenian hieroglyphs appeared later than the Armenian alphabet. Undoubtedly, a separate interest caused the following question: are there any interrelations between the Armenian and the foreign hieroglyphs? Hr. Acharyan thought, that the primary hieroglyphs of constellations were taken from foreigners and were so much changed, that absolutely differed from the origins. But Hr. Acharyans opinion was rejected by the works and conclusions of foreign and modern Armenian astrophysicists, archaeologists and historians. In order to make easier the research of the investigators, A. G. Abrahamyan collected about 800 hieroglyphic signs from more than 50 manuscripts of Matenadaran with correspondent referrals to these manuscripts. He tried to find out the sources of the Armenian hieroglyphic signs. With this purpose he compared the Armenian hieroglyphs with the Hettitian (table 1), Egyptian (table 2), and Indian  from Monhejo-Daro (table 3). A. G. Abrahamyan found out that the Armenian hieroglyphs are amazingly like the Indian ones. By the way, one can also see hieroglyphs and signs, which are very much like the signs used in Greek and Latin letter writings. However, millenniums before of the creation of the hieroglyphs the rock art existed, which can serve as a rich source and a dictionary for the creators of the Armenian hieroglyphs. If we accept the idea that the creators of these hieroglyphs were acquainted to the rock art, which nobody can reject, so they could be used for many years and they could coincide in the meaning. In the basis of the comparative analysis of the rock arts and the hieroglyphs, which was held by the authors of this article under the leadership of Professor G. Vahanyan (Yerevan State Academy of Fine Arts), are laying the rock pictures of the hilly settlements of the territory of Armenia (Geghama Mountains, Syunik, Vardenis, and Djermajour). In the research there were used about 1 300 rock pictures an 800 hieroglyphs, including Armenian, Egyptian, Indian and Hettitian. A likeness is revealed between more than 150 fragments and graphical images of Armenian rock arts and Armenian, Egyptian, Indian and Hettitian petroglyphs, hieroglyphs and ideograms. On the main pages (fig. 1) of the web site (http://www.iatp.am), which was worked out by IATP/IREX project with financial support of the Bureau of Education and Culture of US State Department, one can find likeness between several rock pictures fragments and the hieroglyphs (fig. 2). 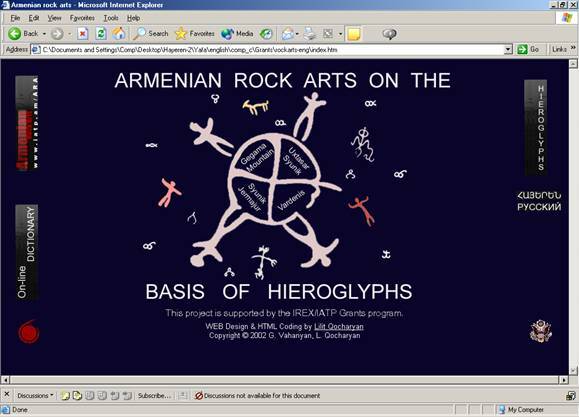 This project obviously illustrates the authors conclusion, that the Armenian rock arts were the primary source for the creation of Armenian, Egyptian, and Indian and Hettitian hieroglyphs as well. Revealing similar signs, elements, structures and forms, likeness between the motives in the hieroglyphs and the motives of the rock arts (by the way similar to the Armenian ornaments, implemented in carpet-making, dress-modeling, taraz (national costume), decorative-applied arts, architecture), the authors are going to prove, that in the basis of the projection of the most Armenian, Hettitian, Egyptian, and Indian as well, lies the historical experience of creation and implementation of the rock arts, which were discovered on the territory of Armenia. The authors do not exclude the factor that the creators of the hieroglyphs implemented the local petroglyphs and rock arts sign. The comparative analysis of numerous rock pictures and hieroglyphs, which were discovered in the corresponding regions and their comparison with the Armenian hieroglyphs will allow the researchers to come closer to the truth, to hold detailed and wide circle study with the goal of confirmation of the authors conclusions about the primary source of the ancient letter writing, about the natives of the territory of Armenia, who were the creators of the ideograms. How and why they were spread all over the world, and when, in which stage of civilization they were undergone significant changes, modifications and deformations? At any rate the authors exclude a significant influence from outside on the creation of the Armenian hieroglyphs, as if whenever the Egyptian, Hettitian and Indian hieroglyphs have been created, they were created later than the elements of the Armenian rock arts. But we cannot exclude the opposite statement: the influence of the Armenian rock arts on the birth and development of other nations rock arts, as a method of conversation, education, saving, spreading and passing the knowledge from generation to generation. Ought to be mentioned, that the Armenian, Hettitian and Indian languages belong to the Indo-European family. What concerns the Egyptian language, it supposed that in ancient Egypt the priests and the governmental bodies were using one of the Indo-European languages, for example  the hiksosian. In the rock pictures our forefathers, who lived millenniums (perhaps dozen millenniums) before us, expressed their thoughts and became great discoverers and creators of masterpieces of ancient arts. Unfortunately, many of those masterpieces were lost and have not been found and interpreted yet. The authors suggest already known interpretations and classifications of the hieroglyphs and ideograms. They also suggest collecting all the existed samples of all the nations in a unique systematical text graphical database, in order to hold a complex international research on interpretation of rock arts and petroglyphs, and on recreation of methods and technologies of arts and archeothinking. In this tremendous work the methods and algorithms of the computer graphics, graphical modeling, analysis, and synthesis and image recognition will have a great role. 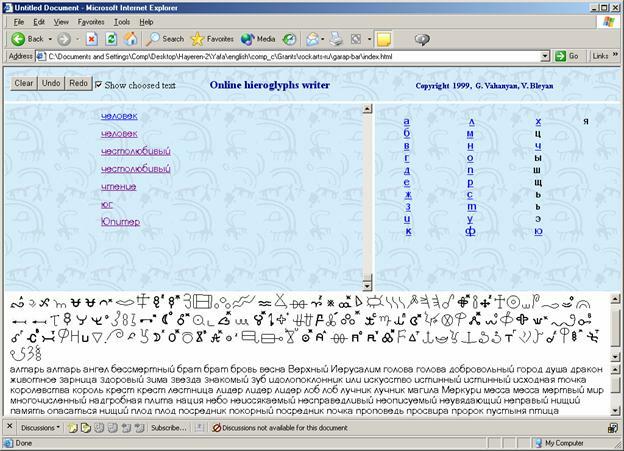 In order to make easier the interpretation of rock arts, ideograms, and the reading of the ancient manuscripts, the authors of this article created a three-language computer program called Hieroglyphic editor (figure 4). It can also be used for the study of the Armenian hieroglyphic letter writing. The user chooses the needed word (or word combination for the expression of an idea or a group of ideas) according to the alphabet and clicking on it the screen shows the corresponding ideogram or ideograms, which can be written in format of any text editor. The designers can use the program for the search of the needed image of an idea, which can be implemented in the creation of logos, logotypes and trade marks. The artists and the art critics can participate in a virtual dialogue; communicate with their forefathers for the organic transmission of an idea, feelings, moods; work out an invariant, accessible creative and figurative language  in two words  visual thinking. The hieroglyphic editor affects on sense, waking up the hidden abilities, stimulating the users intellectual potential. It connects us with the past (from the point of view of time and space). It brings us to a condition of recognition of the archeoknowledge. Drawing ideas with the help of the editor, we save the traditions and continue to create according to our forefathers admonitions. The offered editor is a tool, which rehabilitates the cleaned memory; stimulates sense and interest towards the hieroglyphs. The hieroglyphic letter writing (except the Chinese and Japanese) disappeared in the annals of the history, as if it was rather complicated in implementation and teaching. Not everyone mastered the hieroglyphs. 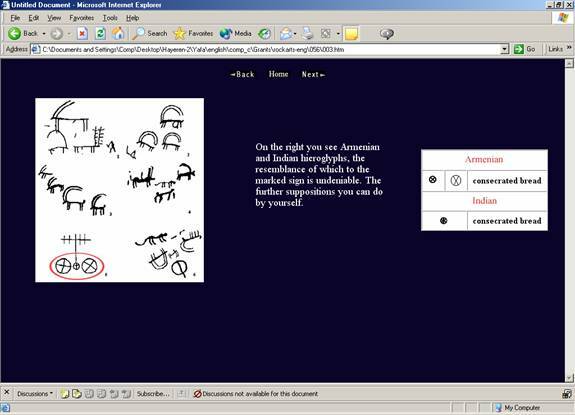 This computer editor removed these problems, it teaches visual contact, invites to create collectively, to make searches and to decode the rock pictures, symbols, inscriptions on the stones, ideograms, which are inaccessible for the scientists of different countries with different languages. This instrument will make easier the solving of problems of establishment of the sources of the Indo-European languages; the study of the history of the alphabets and sign systems; help the art critics in the research of the miracles of ancient culture; help in revealing of the motives in ornaments, national costumes. The psychologists will study the methods and the models of thinking more effectively. The designers will use it in the creation of trade marks. The carpet makers will implement in their job. The programmers will create algorithms of collecting and keeping of the knowledge. The scholars of religion will easier decode the religious symbols. 1. Vahanyan G. Searches for the Heritage of Protocivilization. ArtePreistorica, Rock Art Review, http://www.artepreistorica.it, Oct. 2003, Italy. 2. Vahanyan G. Computer Graphics Art in Armenia, EWVO2, East-West-Vision, International Workshop - Project Festival, Sep. 10-13, 2002, Graz, Austria. 3. Vahanyan G., Petrosyan S. Karedaran - the Computer Database of Armenian Rock Art, http://rupestre.net/tracce/12/armen1.html. TRACCE On-line Rock Art Bulletin -12, Italy, 1999. 4. Vahanyan G. Internet and Culture. US Research and Educational Program. Alumni Armenian Association Democracy Building in Armenia. Seminar Proceeding, Yerevan, Armenia, 1999. 5. Vahanyan G. The Stone Annals of the Civilization. Electronic version of the monograph (in Armenian and Russian), http://www.iatp.am/vahanyan/kamlet, Yerevan, Armenia, 1993. 6. Melik-Bakhshian St. The Armenian letter writing. Publishing House of the State University, Yerevan, 1987. 7. Acharyan Hr. The Armenian Letter Writing. Yerevan, 1984. 8. Martirosyan A. The Rock Arts of the Geghama Mountains. Academy of Sciences, Yerevan, 1982. 9. Abrahamyan A. The Armenian letter and letter writing. Publishing House of the State University, Yerevan, 1973. 10. Martirosyan A., Israelyan A. The Rock Arts of the Geghama Mountains, Academy of Sciences, Yerevan, 1971. 11. Karakhanyan G., Safyan P. The Rock Arts of Syunik. Academy of Sciences of Arm. SSR, Yerevan, 1970. 12. Dunaevskaya I. The Language of the Hettitian Hieroglyphs. Moscow, 1969. 13. Istrin V. The Appearance and the Development of the Letter. Moscow, 1965. 14. Diringer D. The Alphabet. Trans. from English, Moscow, 1963. 15. Doublehoffer E. The Signs and the Miracles. Trans. from German, Moscow, 1963. 16. Fridrich I. The decoding of the forgotten letter writings and languages. Trans. from German, Moscow, 1961. 17. Champalion G. About the Egyptian Hieroglyphic Alphabet. Trans. from French, Moscow, 1950.